You are going to save yourself hundreds or thousands of dollars, so you must be prepared to invest the time into doing it right. 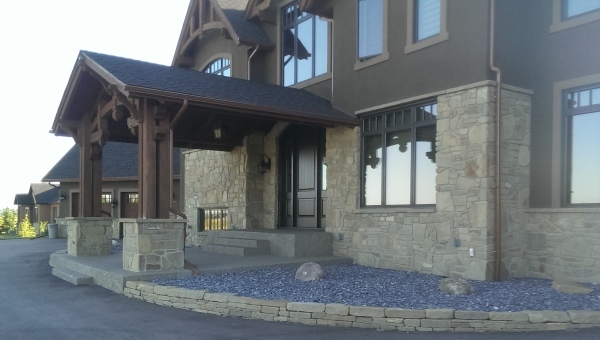 There is nothing more beautiful and elegant, than the look of a natural stone wall. After building many walls, I still feel a sense of pride and pleasure when I stand back and look at the work I have done. This may not be for everyone though, you must be willing to get dirty, and possibly have a few bruises or cuts along the way. 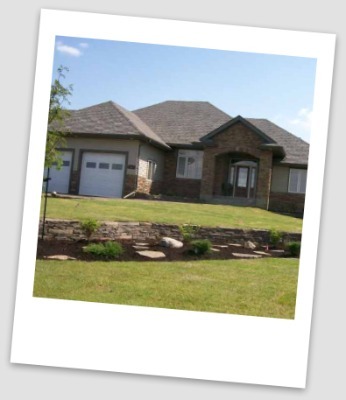 If you are still at the thinking stage, we recommend you visit our photo gallery for some retaining wall ideas. 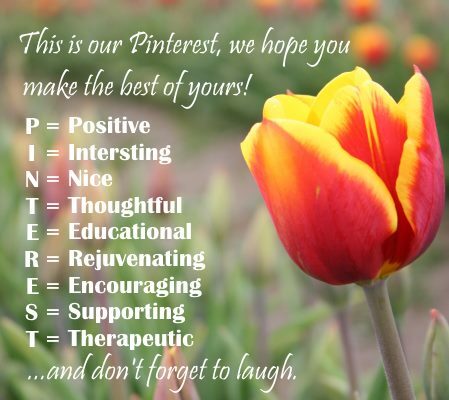 You can also follow us on Pinterest by clicking the Pinterest button on any sidebar. We have over 80 different landscaping categories on Pinterest, with over 11000 pictures including a section on stone wall ideas. This module is designed for building natural stone walls to a height of 3 to 4 feet. Walls over this height generally require an engineered wall and may be beyond the scope of most do-it-yourselfers. Decorative and low stone walls like this are not retaining a soil bank and are easier to build. Regulations may vary in different areas on when engineered walls are required, so we suggest you check with your local authorities. One way to avoid having to build an engineered wall is to terrace your project. This is simply building multiple smaller walls in place of one large one. We must note that even terracing may have specific requirements of how far apart each terrace has to be before you build the next wall. You don’t need to own expensive equipment, or many tools to build a natural stone wall. What you will need is proper planning, patience, and a willingness to learn. This how-to is designed to give you the confidence and knowledge that will allow you to complete your project like a professional. We will try to keep things simple and easy to follow with pictures, diagrams and video when possible. A stone garden wall must have a properly prepared sub base (solid ground or gravel under the wall), proper back fill and drainage behind the wall, batter (angle), and landscape fabrics or geotextile (for northern climates with heavy frost). These elements vary depending on the zone (climate), that you live in. 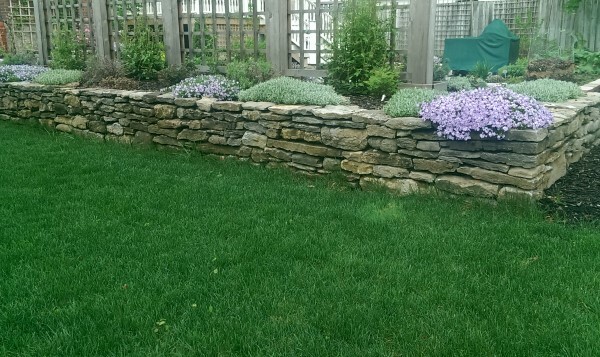 There is nothing like the look of a well built dry stacked fieldstone wall. It may also be required by law to have fences and railings installed if there is a certain drop of the edge of a patio wall. If your wall is supporting heavy vehicles on a driveway, you may need to use advanced construction methods. It is always your responsibility to follow up, and check on all legal requirements for you area. Let’s get to it. And don’t forget to take lots of pictures. We would love to see them and post them on the site. I have broken this down into different sections with explanations for each one. If there is anything that you don’t understand please feel free to contact us. I hope you enjoy this and find it a useful starting point.